There’s been a lot of talk lately about the power of video as a storytelling tool for non-profits and other membership organizations. The fact is that while a picture may be worth a thousand words, with video, you can show and tell! And when done effectively, video can evoke the viewer’s emotions – making it truly powerful, with lasting impact. Would your supporters be receptive to video? “71% of online Americans use video-sharing sites such as YouTube and Vimeo, up from 66% a year earlier. The use of video-sharing sites on any given day also jumped five percentage points, from 23% of online Americans in May 2010 to 28% in May 2011. So you decide you want to create a video, what do you do next? Causevox and ListeninPictures wanted to help organizations tell powerful stories to mobilize your supporters and propel peer-to-peer giving. 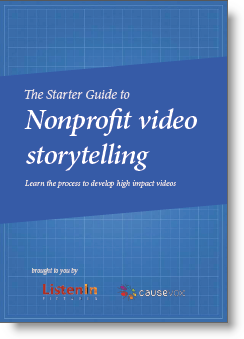 So together, they developed an ebook about how to create a non-profit video strategy called: The Starter Guide to Non-Profit Video Storytelling. What questions you should always ask before starting a video project. How to avoid the biggest mistakes of non-profit video. What the key ingredients of effective videos are (including a huge list of ideas). When you should produce videos internally and when you should outsource. How to move from making videos to telling stories. How to structure compelling impact stories. How to tell stories that mobilize and inspire. How to use video to create effective fundraising and advocacy campaigns. To download a free copy of this e-book visit: http://http://www.startstorytelling.com/. Is video effective for associations and other membership organizations too? While video can have a powerful impact for non-profit fundraising or advocacy, it can also be effective for membership recruitment. For example, you could create one or a number of video testimonials of existing members explaining the benefits of membership in your organization and post them on your website. After all, recommendations from friends or peers are powerful recruitment tools. As I noted in a recent post – Fresh Ideas for Member Development – “member word-of-mouth recommendations (90%) continue to be the most common means by which prospective members learn about an organization,” according to the 2011 Membership Marketing Benchmarking Report. Video can also be effective in providing information about your programs or services or telling the story about a particular project. Just as with a non-profit videos, you can find visual ways to grab the online viewer’s attention and convey information through brief, interesting and digestible pieces through a short video. Everyone - including your prospective and current members are busy these days - with little time to read through lengthy information pages, but most of us are willing to watch a short video. At Wild Apricot, we've found that video is effective in driving traffic to our Membership Management Software website and offering high conversion or software purchase rates. In fact, our success with our YouTube page led us to include a new video page on our marketing website – where we offer our product videos as well as our Webinar archives and news videos. We are also starting to post our videos to our Facebook page more frequently for increased exposure. “People will forget what you tell them, but will never forget how you make them feel.” (Maya Angelou). This is true of video storytelling for non-profits, charities and even membership organizations. Keep us posted on your video storytelling adventures – leave us a comment below to let us know about your success or even your challenges.